$1,095.00 & FREE Shipping on orders over $59. A Fantastic New Labeler Design at a Fantastic Price! Finally, the exact labeling machine that you've been asking for! Are you tired of labeling machines that don't deliver when it comes to great product design and a reasonable price? Are you sick of labelers that are hard to feed, or that require you to re-position the bottle to apply the back label? Have you been shopping for a labeler and just not seen anything that felt like it wasn't a compromise in one way or another? If you answered yes to any of this then the new labeler from Momentum Development is the machine that you've been searching for. Finally, a simple, manual labeler that will apply front and back labels in one smooth motion and without requiring you to re-position the bottle. No motors or electric controls, just a simple clutched carriage to rotate the bottle and apply the labels - all you do is slide the carriage back! See our short video clip listed under the "Video" tab for a quick demo of how the labels are applied. The Momentum Development labeler is extremely easy to feed and to set up. Instead of fancy timers and motors to deal with when it comes to setting up your front-to-back label spacing, this machine works based on some very simple math and on measurements made with a ruler. Takes about 10 minutes to set up and as with any labeler about a case's worth of bottles to fine tune. This labeler is made from thick, ABS plastic fixed on an aluminum base. The rollers and advance mechanism use high quality bearing and rubber coatings. Overall this machine just screams durability. 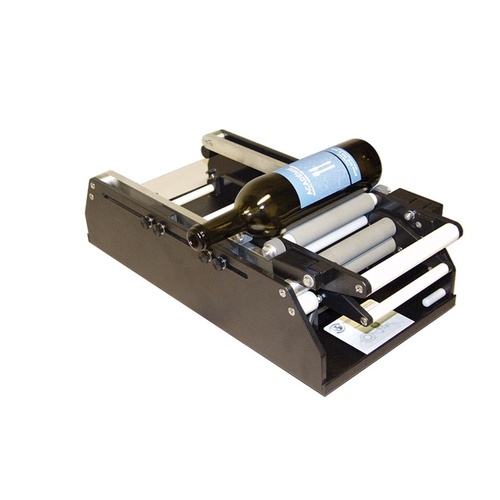 Max Label Roll Diameter 9"
Simply feed a roll of labels through the machine. Place the item to be labeled on the rollers. Set the stops on the machine for a single label or front and back labels. Remove the item from the rollers. Pull the carriage back and place the next item on the rollers. No motors to wear out. Place your labels exactly where you want them to be. Every time. Engineered and manufactured in the USA from durable, quality components. We have produced about 30 cases the last several years. Will be between 50-60 next year. After spending too many nights hand labeling in front of the TV, we decided to buy a machine labeler. This unit is the most economical on the market. You can spend over $2,000 and buy one with a motor, but, IMO it's just marginally faster. Takes some time to figure out spacing if you use front and back labels, so be prepared to waste 20 or so labels getting it set up. It does drift a little during labeleing, but I was finally able to adjust on the fly. Soundly built. I am happy. We have used this to label a couple of thousand bottles to date. It is as advertised and works just fine after a slight learning curve. IF you follow the directions EXACTLY, you will find the machine does just what it is supposed to do. It takes a bit to dial this device in but once you get the hang of it you can whip through hundreds of bottles without a glitch. Well worth the cost and it will produce a professional looking wine bottle.